One of the most common injuries in sport is the hamstring strain, as the hamstring muscles are very susceptible to tears and strains. the pelvis, and the bottom of the hamstring muscles are attached to the tibia and fibula (shin bones) just below the knee joint. The action of the hamstring muscles is to flex (bend) the knee and extend (straighten) the hip. 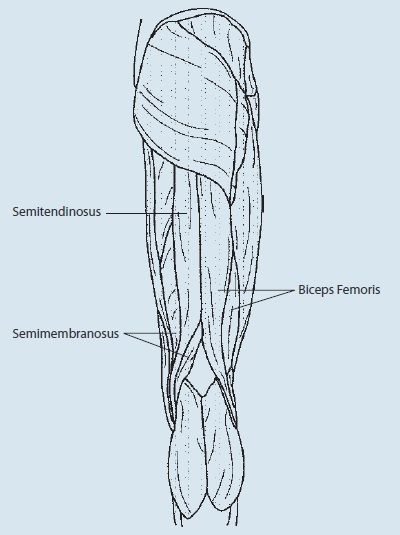 Hamstring strains are classified as Grade 1–3 strains depending on severity. A hamstring strain may occur in one or more of the three muscles in the group. Muscular strength and flexibility in reduced. Severe or complete rupture of the muscle. May be a large lump (of muscle tissue) above a depression where the tear is. The immediate treatment of any soft tissue injury consists of the RICER protocol – rest, ice, compression, elevation and referral. RICE protocol should be followed for 48–72 hours. The aim is to reduce the bleeding and damage in the muscle. The muscle should be rested in an elevated position with an ice pack applied for 20 minutes every two hours (never apply ice directly to the skin). A correctly sized compression bandage should be applied to limit bleeding and swelling in the injured area. Timeframes for rehabilitation and return to sport vary depending on the nature and severity of the strain. As a general rule, Grade 1 hamstring strains should be rested from sporting activity for about three weeks and Grade 2 injuries for a minimum of four to eight weeks. In the case of a complete rupture (Grade 3 strain), the muscle may have to be repaired surgically and the rehabilitation to follow will take about three months.